When prescribed correctly, fitted correctly, and cared for correctly, contact lenses can provide clear and comfortable vision. Unfortunately, not every contact lens wearer achieves this happy balance initially. On the contrary, many people who wear contact lenses complain of some level of discomfort, from mild contact lens awareness (essentially, the sensation of having something in your eye) to significant pain. In any case, you shouldn’t ignore contact lens discomfort. Your lenses can and should fit properly, and if they don’t something is wrong. If your eyes are feeling itchy, sore, dry, or uncomfortable, or if you’re left with red eyes and blurry vision when you remove your contact lenses at the end of the day, here are six issues that could be contributing to your problem. Lens care matters. This is something you are putting into your eye. Properly caring for and cleaning your lenses are instrumental in ensuring that the lenses will be comfortable to wear (and healthy for your eyes) tomorrow. Throughout the day, your lenses can accumulate bacteria, eyeliner and other makeup, traces of hair products, and even perfume. These impurities cause problems with comfortable wear and interfere with your lenses’ ability to function properly. Even something as simple as not washing your hands before you remove or insert your lenses could be causing your problem. In any case, consulting your eye doctor and setting aside a firmer routine for lens care can help pave the way to higher levels of comfort and hygiene in the future. Lens fit matters, too. Your eye is like your fingerprint, in that it’s completely unique. Eye doctors work through a variety of tests, measurements, and processes when fitting your lenses. If you always feel as if you have something in your eye, improper lens fit could be the problem. Fitting issues are a common culprit, especially in instances when the patient is only having problems with discomfort in one eye. It’s possible that one lens might fit right, but the other might be a bit off. Make sure you consult with an eye care practitioner that is specialized in fitting contact lenses to make sure you are wearing the best lens for the unique shape of your eye. When you got your contact lenses, your local eye doctor probably told you how frequently to take them out, how often to clean them, and how long to go before replacing them with new lenses. If you aren’t following these tips, then discomfort and irritation will likely arise. If you aren’t supposed to wear your lenses while you sleep but have been keeping them in overnight, then that’s probably the cause of your discomfort. 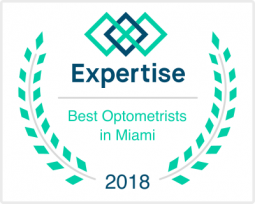 Similarly, if you are using lenses that have expired or reached the end of their recommended lifespan, not replacing them out could lead to anything from itchiness to infection. Perhaps the top reason to consult your eye doctor about discomfort or pain associated with your contact lenses is an eye infection. Wearing contacts can increase the risk of bacteria getting into your eye and causing an infection. If left untreated, these infections can escalate in severity—to the point where they permanently damage your vision. If you are experiencing any pain, discomfort or redness with your current lenses, make sure you see your eye care practitioner immediately. No one would be able to adequately tolerate any type of lens if their ocular surface is dry. Dry eye disease is an extremely common and treatable problem. In order to maximize comfort and vision with any type of lens, it is important to make sure the ocular surface is well lubricated. If you are experiencing any form of discomfort with your current lenses, make sure you speak to your eye care practitioner about available treatments for dry eyes. If you can’t seem to find lenses that fit, then there is a chance you just aren’t wearing the right type of lenses. For instance, if your corneas are irregularly shaped, you aren’t going to have much luck finding soft lenses that fit right. Talking to an eye doctor that works with specialty lenses like scleral lenses or custom designed lenses can give you a better (and more comfortable) solution to your vision problem. At Weston Contact Lens Institute, specialty lenses are our specialty. To get help with discomfort caused by contact lenses, call us today and schedule your first appointment.